SKYLasers has released a 2010 product update model for its catalog of laser pointers. SKYLasers is a manufacturer of high power laser pointers, portable lasers and lab laser systems based in China with an office in the United States. One of the two consumer-grade laser products from SKYLasers is green laser, which blasts highly-visible 532nm green laser beam. With 2010 product refresh, the SKYLasers Green Laser Pointer now features the patented Dual-Lock safety feature. Thanks to the manufacturer, My Digital Life has a 125 mW SKYLasers Green Laser Pointer with Dual Lock for review. The green laser pointer is basically a diode-pumped solid-state (DPSS) lasers where solid-state lasers are made by pumping a solid gain medium, for example, a ruby or a neodymium-doped YAG crystal, with a laser diode. The SKYLasers Green Laser Pointer looks like a pen. In fact, the delivery package was written with “pen” as its content. The description is true to certain extent, except the laser pointer is longer, larger, and emits laser beam instead of ink. The SKYLasers Green Laser Pointer is packaged inside a box, just like a premium branded ball pen does. However, if the battery cap is put on, the laser point won’t be able to fit into the box. 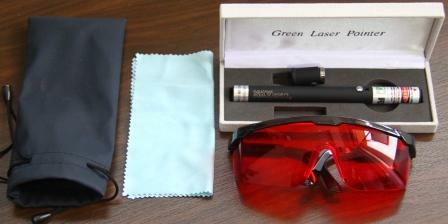 In addition, there is a protective green laser goggles with red lens (may be required to purchase separately) for the eyes (which definitely is a must for such a high powered laser) with a micro-fiber cloth to clean the goggles. No battery is included, and the SKYLasers Green Laser Pointer requires two AAA batteries to work. Considering the power of the laser emitted by the laser pointers, two AAA batteries are probably too few, but that also explain the low rating of battery lifetime. Patented Dual Lock Technology consists of two separate locking features, namely gold plated key lock which located on the side of the laser pointer, and gold-plated remote lock at the rear of the laser pointer, which also allows users to power the laser pointer at a remote location. Battery lifetime of 30 minutes. All laser products sold in US has to be registered with FDA. SKYLasers claimed that it’s a FDA approved manufacturer of laser products with all required safety locks and features required for a Class IIIB laser. With a 95mW and above green laser pointer, the burning powers of our lasers can light matches, melt dark plastics or rubber, pop balloons, sting bare skin, etch leather, burn dark fabrics, light fireworks, cut electrical tape and etc. However, in my experiment, it takes some time for the burning to take effect, which makes it time-wasting and energy wasting (battery life) in practical use. As camera zapper to disable surveillance or security cameras. A lower powered models between 15mW to 35mW of green laser can easily show up on bright LCD / projection screens, and can be used as presentation pointer. Astronomy laser pointer for star gazing, which I found is the most useful, as the green laser beam virtually can point as far as the sky. A handy survival tool for nature hikes and outdoor travels, where the brightness of high power lasers may scare away wild animals (don’t bet on it though) and can be used as a rescue signal in search and rescue situations. To create laser effects for photography. Last but not least, laser pointer can also be a gadget for entertainment or to impress friends and family alike. 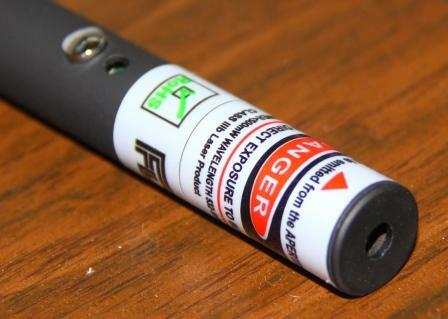 The list of possible usage for a green laser pointer looks wonderful, though personally, I don’t find much use with the laser pointer, probably due to the extremely high powered laser beam and its safety concern. 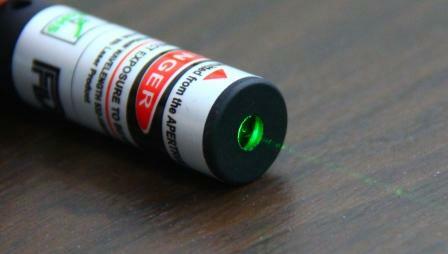 A lower powered green laser pointers may be more suitable for everyday use. As a gadget, I love it though. 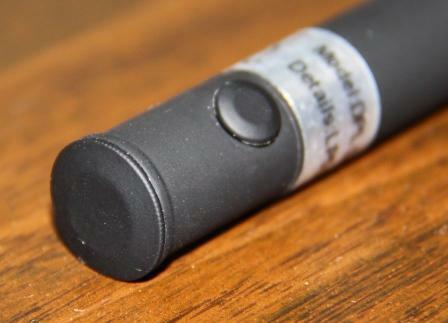 Using the laser pointer is dumb-proofed-easy. Just insert the batteries according the instruction (right direction), tighten the cap, and press the ON button to beam the laser. Release the button, and the laser pointer is automatically off. The Dual-Lock feature includes a key lock, which has to be pulled out, and a remote lock, which has to be turned out. Either one of the lock is not presented, the laser pointer simply won’t work. No spare is given, so make sure that you never lose the locks. One main safety consent for all DPSS green laser products is whether the infrared (IR) radiation, which is invisible to the human eyes, is been filtered. According SKYLasers, all SKYlasers green laser pointers and green portable lasers are equipped with infrared filters to reflect or block infrared radiation while letting visible light pass. Nonetheless, even with just the green laser, it can cause safety hazard especially to the eyes. Laser radiation can cause injury or damage to the retina via thermal effects, where as a high power lasers can also burn the skin, or even its diffuse reflection from a surface can be hazardous to the eye, or cause uncomfortableness to the eye. SKYLasers Green Laser Pointer (2010 model) also equips with 2 safety pins, which when plug-out, will render laser pointer inoperable. The safety feature is definitely a good way to prevent accidental use by kids and unknowing people. So, in all cases, when using the green laser pointers, don’t point it directly into anybody’s eye, and wear a laser safety goggles when operating a laser pointer. There are probably many cheaper green lasers around in the market, but SKYLasers guarantees its laser pointers build quality and rated power output, especially the infrared filter, which is essential for protecting the system from exposure damage. SKYLasers Green Laser Pointer with Dual Lock is definitely a nice gadget, although in my opinion, is not a must-have. Hobbyists however will get a top-grade laser pointers with all necessary safety features at reasonable price. Disclaimer: My Digital Life receives a laser pointer to review.